April 9, 2019 10:32 am. Trainer George Weaver, a native of Louisville, Kentucky, has had one previous starter in the Kentucky Derby (G1), a 52-1 longshot that beat just one horse to the finish in 2015. 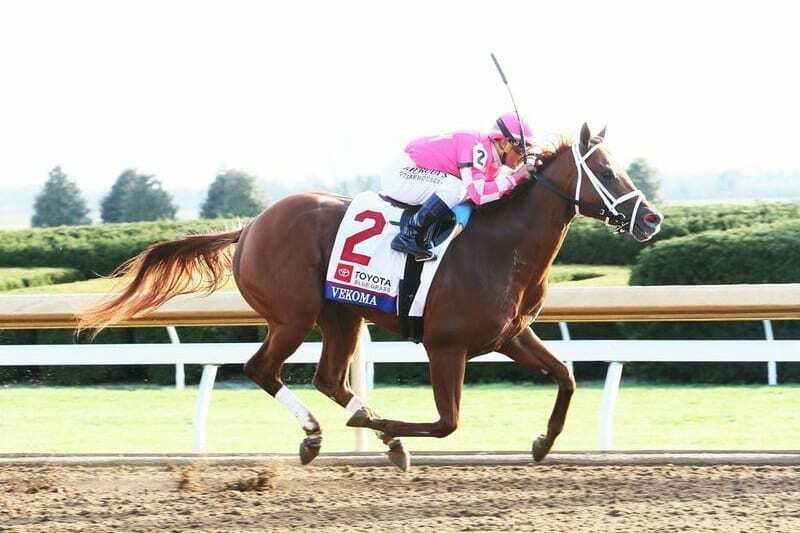 Weaver will head back to Churchill Downs in four weeks with a much stronger contender in Vekoma, who made good with the betting public’s expectations by dominating the $1 million Blue Grass (G2) at Keeneland by 3 1/2 lengths on Saturday. Making his second start of the season following a third-place effort in the Fountain of Youth (G2), Vekoma applied steady pressure to pacesetter Somelikeithotbrown much of the way, poked his head in front around the second turn, and drew off in the stretch under Javier Castellano. “He’s so talented. He’s done things in the morning for me that I haven’t really had a colt like this the whole time I’ve trained,” Weaver said. Owned by Gatsas Stable and R. A. Hill Stable, Vekoma returned $4.80 as the 7-5 favorite in the field of 14 after covering 1 1/8 miles on a fast track in 1:50.93. Second choice Win Win Win rallied to edge Signalman for second by a nose, with Somelikeithotbrown holding on for fourth. As part of the Road to the Kentucky Derby series, the Blue Grass awarded Derby qualifying points of 100-40-20-10 to the top four horses. Vekoma has now earned 110 points, Win Win Win 50 points, Signalman 38 points, and Somelikeithotbrown 30 points. Vekoma now has three wins in four lifetime starts. At two, he won on debut at Belmont Park by 1 3/4 lengths going six furlongs. In his final start of an abbreviated campaign, he captured the Nashua (G3) by the same margin going one mile at Aqueduct. He’s now earned $788,850. Bred in Kentucky by Alpha Delta Stables, Vekoma was a $135,000 Keeneland September yearling. He’s by Candy Ride and out of Grade 1 winner Mona de Momma, by Speightstown.